The release of the IPCC Special Report on Global Warming of 1.5 degrees Celsius shows the world is lagging dangerously behind the targets needed to avoid catastrophic levels of climate disruption. Strangely immobilised by the immensity of the issue, many have tended to turn to solutions which do not require us to make changes to our own lifestyles. In the week of October 7 to 14, faith communities campaigned to change this. People from diverse religious traditions came together in eight locations across Australia and 70 places globally, as part of a campaign called “Living the Change: faithful choices for a flourishing world”. The campaign challenges believers to make concrete commitments to living more simply, in line with their deeply held values. Anglicans, Buddhists, Catholics, Jewish, Uniting Church, Hindu, Muslim and other people of faith publicly pledged ambitious low-carbon lifestyle changes. The events acknowledged the personal sacrifices needed for these pledges but had a celebratory tone, with musical performances, food, workshops and film viewings. The event in Adelaide included performances by Aboriginal dance mob Dusty Feet. There are indeed sacrifices, but there are many co-benefits that come with simpler lifestyles. Moving towards plant-based diets, walking and cycling bring health benefits; using public transport and reducing air travel slows down the frenetic pace of life; more energy efficiency and renewable energy means less pollution; congruence with personal values enhances self-worth. 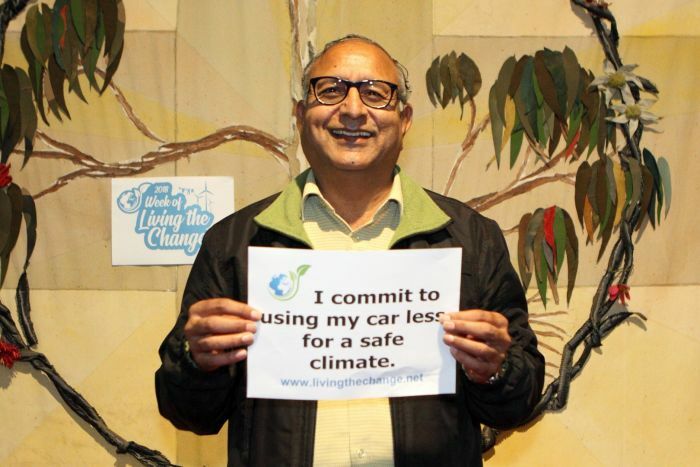 Living the Change in Australia is supported by the Australian Religious Response to Climate Change, Religions for Peace, the Multi-Faith Association of South Australia, Anglican Eco-Care Commission, United Religions Initiative and local faith-based communities.